Geckos are small to average sized lizards belonging to the family Gekkonidae, which comprises dozens of genera and several hundred different species found in warm climates throughout the world. Most geckos are arboreal (inhabiting or spending large amounts of time in trees or bushes) and nocturnal. Geckos are unique among lizards in their vocalizations, making chirping sounds in social interactions with other geckos. The name stems from the Malay word gekoq, imitative of its cry. Geckos are unusual in other respects as well. Most geckos lack movable eyelids and instead have a transparent membrane that they lick to clean. Many species have specialized toe pads with microscopic, hairlike projections that enable them to climb smooth vertical surfaces and even cross indoor ceilings with ease. These antics are well-known to people who live in warm regions of the world where several species of geckos make their home inside human habitations. These species (for example the house gecko) become part of the indoor menagerie and are seldom really discouraged because they feed on insect pests. The diverse color, patterns, and behaviors of geckos add to the wonder of nature for humans. Furthermore, just as many human inventions and innovations have been based on systems in creation, the gecko's unique method of walking on walls and even ceilings has lead to efforts to develop practical applications for this knowledge, such as boots for walking on surfaces in space. Gekkonidae is one of about 40 families of lizards. Lizards typically are distinguished from snakes by having less flexible jaws than snakes, movable eyelids, external ear openings, and most have four well-developed limbs, often with five toes on each foot. 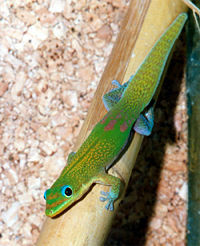 Most geckos, however, lack movable eyelids, and while most have five digits on each foot, some have only four digits. Their characteristic sounds, unique among lizards, vary according to species. Geckos are arboreal and nocturnal, and generally feed on insects and other small prey, utilizing their long tongue. Many species will, in defense, expel a foul-smelling material and feces onto their molester. Some species are parthenogenic, the females capable of reproducing without copulating with a male. This improves the gecko's ability to spread to new islands. The toes of the gecko have attracted a lot of attention, as they adhere to a wide variety of surfaces, without the use of liquids or surface tension. 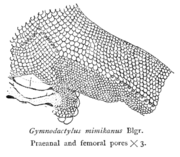 As explained by Keller Autumn (Beres 2003), involved is millions of microscopic hairs, or setae, on the bottoms of the geckos' feet, with each seta ending in an array of nanostructures, called spatulae, that function as a dry adhesive (Beres 2003). Recent studies of the spatula-tipped setae on gecko footpads demonstrates that the attractive forces that hold geckos to surfaces are van der Waals interactions between the finely divided setae (almost 500,000 setae on each foot, and each of these tipped with between 100 and 1,000 spatulae) and the surfaces themselves (Autumn et al. 2002). These kinds of interactions involve no fluids; in theory, a boot made of synthetic setae would adhere as easily to the surface of the International Space Station as it would to a living room wall, although adhesion varies with humidity and is dramatically reduced under water, suggesting a contribution from capillarity (Lee et al. 2007). Geckos' toes seem to be "double jointed," but this is a misnomer. Their toes actually bend in the opposite direction from our fingers and toes. This allows them to overcome the van der Waals force by peeling their toes off surfaces from the tips inward. In essence, this peeling action alters the angle of incidence between millions of individual setae and the surface, reducing the van der Waals force. Geckos' toes operate well below their full attractive capabilities for most of the time. This is because there is a great margin for error depending upon the roughness of the surface, and therefore the number of spatulae in contact with that surface. If a typical mature 70 gram gecko had every one of its spatulae in contact with a surface, it would be capable of holding aloft a weight of 133 kilograms (Beres 2003). Each spatula can exert an adhesive force of 10 nN (Lee et al. 2007). The setae on the feet of geckos is also self cleaning and will usually remove any clogging dirt within a few steps (Hansen and Autumn 2005). Some geckos, such as the banded gecko, Coelonyx variegatus, lack the adhesive pads on the toes. The banded gecko is also one of the few gecko species with movable eyelids. Bibron's gecko, Pachydactylus bibroni — Native to Southern Africa, this hardy arboreal gecko is relatively common as a pet. Crested gecko, Rhacodactylus ciliatus — Believed extinct until re-discovered in 1994. Gaining in popularity as a pet. Unlike most other geckos, it prefers room temperature and is omnivorous. Crocodile gecko or Moorish gecko (due to their crocodile-like looks. ), Tarentola mauritanica — Crocodile geckos are very strong and heavily built for their size usually growing up to 15.24 cm (6 in). They are commonly found in the Mediterranean region from the Iberian Peninsula and southern France to Greece and northern Africa. Their most distinguishing characteristic is their pointed head and spiked skin with their tail resembling that of a crocodile. Cyrtopodion brachykolon; commonly known as "bent-toed gecko," found in north-western Pakistan. Gargoyle gecko, Rhacodactylus auriculatus — commonly known as the New Caledonian bumpy gecko or gargoyle gecko. Gold dust day gecko (Phelsuma laticauda laticauda (Boettger, 1880) (syn. Pachydactylus laticauda Boettger, 1880)) is a diurnal subspecies of geckos. It lives in northern Madagascar and on the Comoros. Golden gecko, Gekko ulikovskii — native to the warm rainforests of Vietnam. House gecko, Hemidactylus frenatus — A species that thrives around man and human habitation structures in the tropics and subtropics world wide. Indo-Pacific gecko, Hemidactylus garnotii — Also known as a fox gecko because of its long, narrow snout. This species is found in houses throughout the tropics. This gecko may eat leafcutter ants. New Caledonian giant gecko, Rhacodactylus leachianus — first described by Cuvier in 1829, is the largest of the Rhacodactylus geckos. Leopard gecko, Eublepharis macularius — The most common gecko kept as a pet is the leopard gecko, which does not have toe pads with setae, but rather claws. These enable it to more easily climb on rough surfaces like tree bark. This gecko cannot climb the glass of a terrarium. The leopard gecko tends to be docile and calm. This gecko can eat butterworms, cockroaches, crickets, mealworms, waxworms, and superworms. Mediterranean gecko, Hemidactylus turcicus — residential and wild, introduced species (USA). Mourning gecko, Lepidodactylus lugubris — This species is equally at home in the wild as in residential neighborhoods. Found in Hawaii, it may have been an early Polynesian introduction. A parthenogenic species. Ptychozoon, — a genus of arboreal gecko from Southeast Asia, known as Flying Geckos or Parachute Geckos, has wing-like flaps from the neck to the upper leg, to help it conceal itself on trees and provide lift while jumping. Stump-toed gecko, Gehyra mutilata (Peropus mutilatus) — This gecko, commonly referred to as a Gheckl, can vary its color from very light to very dark to blend into a background. At home in the wild as well as in residential neighborhoods. Tree gecko, Hemiphyllodactylus typus — Tree geckos are forest dwellers. Tokay gecko, Gekko Gecko — a large, common, Southeast Asian gecko known for its aggressive temperament, loud mating calls, and bright markings. Western banded gecko, Coleonyx variegatus — Native to southwestern United States and northwest Mexico. Beres, S. 2003. How do gecko lizards unstick themselves as they move across a surface?. Scientific American: Ask the Experts Retrieved September 21, 2007. Forbes, P. 2005. The Gecko's Foot: Bio-inspiration, Engineered from Nature. London: Fourth Estate. ISBN 0007179901. Hansen, W. R., and K. Autumn. 2005. Evidence for self-cleaning in gecko setae. PNAS 102(2): 385-389. Kellar, A., M. Sitti, Y. A. Liang, A. M. Peattie, W. R. Hansen, S. Sponberg, T. W. Kenny, R. Fearing, J. N. Israelachvili, and R. J. Full. 2002. "Evidence for van der Waals adhesion in gecko setae." Proceedings of the National Academy of Sciences of the USA 99: 12252-12256. Lee, H. et al. 2007. "A reversible wet/dry adhesive inspired by mussels and geckos." Nature 448: 338–341. Artificial gecko feet for a Spiderman suit (BBC 2007-08-28). This page was last modified on 24 May 2017, at 16:14.